Conducted awareness programs all over the country. Following are a few highlights. Sant Gulabrao Mahraj Jeeven Shatabdi Samaroh was celebrated at Nagpur. PP. Sarsanghchalakji graced the function. The famous Puttaraj Gawai Centenary was celebrated Dakshin and Uttar Karnatak units successfully. 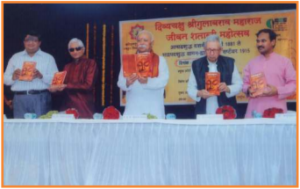 All India Sahitya Sammelan, with Visually challenged poets were held at Kashi and Nanded in a delightful manner. Sant Surdas Jayanti celebrated at Tirpur in a grand manner. Eye donation rally was organised at Jabalpur by elite of the city.